Mobile and fixed broadband network operators, ISPs and other non-telco businesses (enterprises, utilities, industrial and governmental organizations), are today in need of cost-effective and future-proof, high-capacity transport systems that are easy to deploy and operate. Mobile broadband networks are undergoing a continuous transformation in terms of technology and architecture. Mobile broadband network operators need to cope with higher capacity, multi-technology (GSM, HSPA+, LTE, LTE-A, etc.) Base Stations deployed in the ever-increasing density macro-cell layer and in the near future, in an ultra-dense small-cell layer. Heterogeneous Network (HetNet) backhaul in the cities will consist of a large number of short and medium-range links having capacity of a few hundred Mbit/s and in the medium term exceeding in many cases 1 Gbit/s. Cascading three or more sites, or combining them in a ring, will yield traffic capacity of several Gbit/s. The applications of different architectural RAN options, such as Centralized / Cloud RAN (C-RAN), as a means of increasing the network coordination toward greater capacity and spectral efficiency, will bring further transport (fronthaul) capacity increase requirements. UltraLink™-FX80 is a compact, all-outdoor multi-Gigabit Ethernet PtP radio platform, operating in the entire bandwidth-rich E-Band area of the spectrum (71-76 GHz and 81-86 GHz). It offers both Ethernet and CPRI functionality on the same unit, so that it can be used both in backhaul/midhaul and fronthaul applications. Its very-high capacity, low latency and support for all packet synchronization options, fully satisfies the rigorous backhaul requirements of 3G+/4G/4G+ mobile networks. 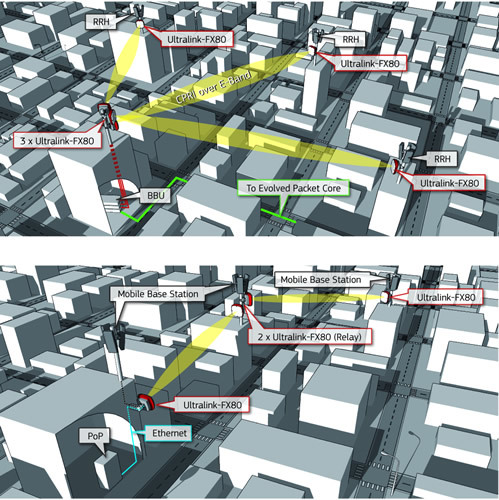 Furthermore, when operating in CPRI mode, UltraLink™-FX80 can support a CPRI traffic stream up to CPRI Option 3 and provide operators the cost efficient fronthaul transport needed to build and extend the reach of their C-RAN-based small-cell networks. Delivering its multi-Gigabit capacity, by employing a simple 1+0 configuration, it achieves the lowest TCO with respect to traditional microwave (MW) - or even wireline - technologies. UltraLink™-FX80's small size, intelligent design, range of antennas and powering options allows it to be easily and quickly deployed at typical telecommunication environments, such as rooftops or telecommunication towers, but also in street-level environments , such as lamp posts, making it ideal for HetNet transport applications. Furthermore, "zero-touch" configuration, through an integrated Bluetooth interface, minimizes its rollout time and safeguards against deployment errors. Up to 3 Gbit/s throughput, QoS and packet synchronization capabilities that satisfy the most demanding 4G/4G+ transport requirements. Highest versatility and small form-factor for macro- / micro- / small-cell backhaul, C-RAN fronthaul and all types of transport applications. Support of native transport of Ethernet or CPRI traffic in one unit. Unique direct AC powering option (without external devices) simplifies deployment at street locations where DC power is unavailable. UltraLink™-FX80's 3 Gbit/s capacity on a single radio link is achieved by combining an industry-high spectral efficiency (using 256-QAM modulation) with bandwidth acceleration in a 500 MHz-wide channel. High spectral efficiency enables the use of narrow channels, which incur significantly-reduced license fees in countries where fees are applicable. Narrower channels also increase the number of available channel options, which allows for denser link deployments through the reduction of frequency reuse and facilitation of planning for interference management and mitigation. The evolution of the field-tested UltraLink™-FX80 - referred to as High Power -adopts a new generation of RF transceiver technology that provides high transmit power and receiver sensitivity. 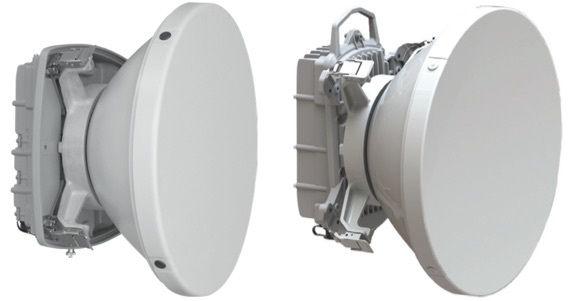 Offering system gain over 100 dB (without antenna), and over 200 dB with antennas, it pushes the range capability of E-Band radios to new highs. UltraLink™'s fast 7-level hitless adaptive modulation and coding can provide seamless system gain and capacity trade-off to enable highest capacity for most of the time and continuous link operation under adverse propagation conditions. The same radio unit can be configured to operate in Ethernet Bridging or CPRI transport mode for providing transparent CPRI fronthaul. UltraLink™-FX80 incorporates a fully-featured, 3 x GbE Provider Bridge (IEEE 802.1ad), which offers flexibility in delivering MEF standards-based Carrier Ethernet services over complex network topologies, such as tree or ring, deployed without the need for additional switching devices. This allows faster and easier deployments that are more manageable and cost-efficient. Furthermore, UltraLink™-FX80 supports a CPRI transmission mode up to CPRI Option 3. When operating in this mode, UltraLink™-FX80 can support a native CPRI traffic stream and provide operators the cost-efficient fronthaul transport needed to extend the reach of their C-RAN network wherever fiber is not available and wherever fiber deployment is financially prohibitive. Importantly, UltraLink™-FX80 software-upgradeability offers the flexibility to support the evolution of fronthaul protocols from packet-based encapsulation over Ethernet to the next generation standards in the future. Support of service OAM, based on the IEEE 802.1ag and Y.1731 standards, and Link OAM, based on the IEEE 802.3ah standard, means that UltraLink™-FX80 is capable to offer Carrier-grade Ethernet OAM features, enabling operators to provide manageable L2 end-to-end services to their customers. UltraLink™-FX80 offers per-service QoS treatment of the transported traffic based on L1, L2 and L3 classifiers. Strict Priority (SP), Weighted Round Robin (WRR), Weighted Fair Queuing (WFQ) and Hybrid SP+WRR/WFQ scheduling schemes are cleverly applied to eight CoS / queues to enable the most suitable prioritization treatment for management and control plane traffic, while supporting revenue-generating service differentiation and assured critical service delivery for user plane traffic. Colour-aware WRED is applied as means to gracefully manage potential queue congestion. Furthermore, policing and shaping are applied to the incoming / outgoing service flows allowing the definition and conformance of services to the desired characteristics. Being an advanced packet radio, which is designed for mobile network backhaul applications, UltraLink™-FX80 supports a full range a packet synchronization methods. Its Gigabit Ethernet interfaces support standards-based Synchronous Ethernet (SyncE) frequency synchronization distribution, as well as, the associated ESMC signaling channel. Furthermore, Precision Timing Protocol (IEEE 1588v2) Transparent Clock and Boundary Clock functionality is supported in hardware for the delivery of frequency and phase synchronization deemed necessary in locations where GPS / GLONASS signals are hard to reach (such as covered / street-level deployments). UltraLink™-FX80 can be offered as a standalone, extremely-lightweight, zero-footprint and all-outdoor system, with maximum powering flexibility (direct AC, direct DC or PoE). Direct AC power feed without external devices enables more cost-effective, faster and more reliable deployments even at street-level environments. Links are easily deployed with small form-factor ODUs (292 mm x 292 mm x 134 mm), which weigh no more than 5.2 kg k(with embedded flat antenna included), thus minimizing the size and cost requirements for the supporting infrastructure. Options with 30 cm or 60 cm parabolic antennas are also available. Apart from all the usual methods (by Ethernet cable connection), UltraLink™-FX80 also offers deployment expediency by featuring "zero-touch" configuration and service provisioning through an integrated Bluetooth interface by employing a standard Android tablet. create Gigabit LANs among their buildings in a site. Depots / large storage areas. Security posts and surveillance cameras. Data Center / control rooms. UltraLink™-FX80 can be used to interconnect public buildings in municipal areas and cities. 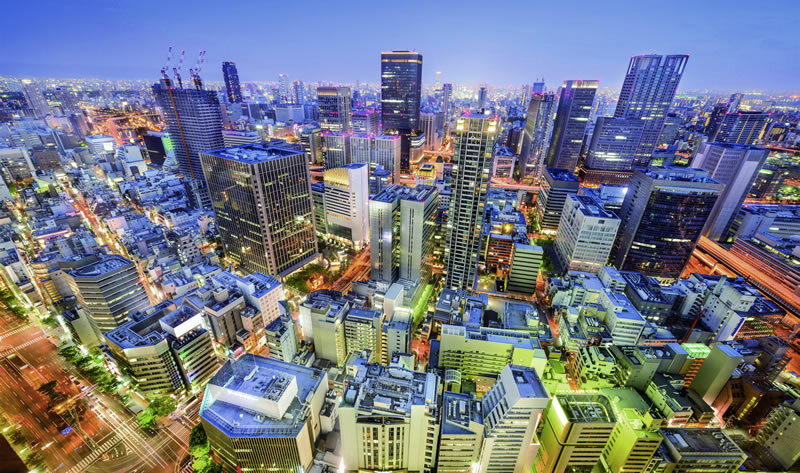 City halls, police headquarters, hospitals, schools and other buildings can converge on the same high-speed network infrastructure to enhance governance efficacy and efficiency. backhaul traffic from security / surveillance cameras. Large businesses with multi-building plants, storage depots or office facilities expanding in large areas, can deploy UltraLink™-FX80 to enable Gigabit LAN connectivity for enhancing their transaction automation, control, productivity and security.